The latest competition for an AESS Trophy and a prize of £25, to mark the Centenary Year was held on May 3rd at the Blackheath Festival. The winner was Elizabeth Jones, a student of Patricia Williams. The AESS will continue to give the cash prize to the ten participating festivals for the next two years. 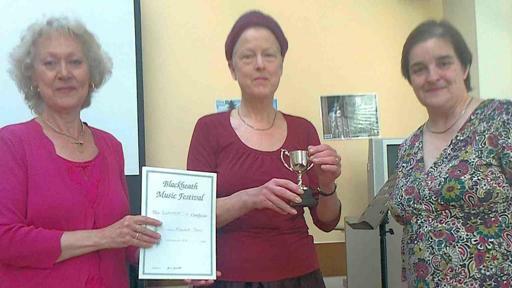 Judge and new AESS Member, Julia Dewhurst with trophy winner Elizabeth Jones and her teacher Patricia Williams. This entry was posted in Past Events on April 28, 2013 by AESS. The new AESS Fell Prize for Musical Theatre took place on Sunday 28th April, at the Sylvia Young Theatre School in London. The adjudicators were Linda Hutchison, Kathleen Savage and Simon James Green, whom we thank for their expertise and helping to make the competition such a success. We also thank Chris Mear, the official accompanist. 27 students from a number of London colleges (also Welsh and Scottish) entertained the adjudicators and an enthusiastic audience with a selection of monologues and songs from such diverse sources as Shakespeare to Kander & Ebb. The standard was very high and it was obvious that competitors had thought about their presentations seriously. The variety displayed throughout the afternoon was remarkable. The winner of the £1000 prize was Joe Leather, from the Royal Academy of Music. It is hoped that this new prize will become a regular feature of the AESS competition year. 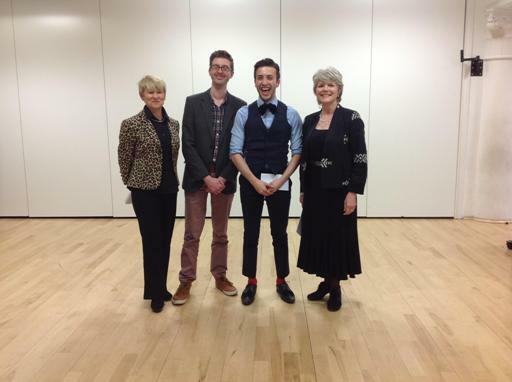 Judges Kathleen Savage, Simon James Green, winner Joe Leather and Linda Hutchison at Sylvia Young Theatre School on Sunday April 28th 2013.